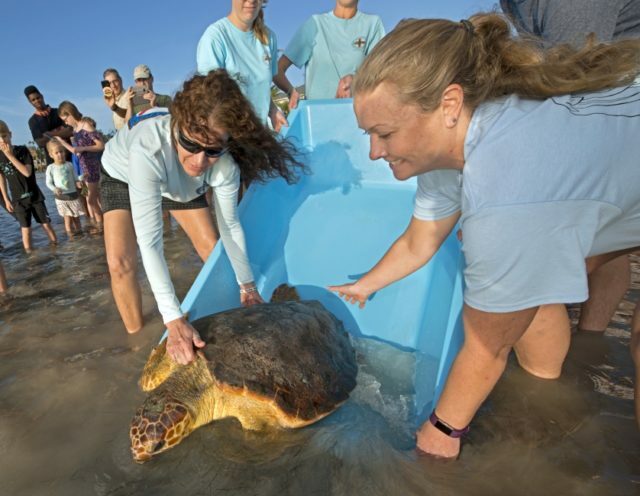 ISLAMORADA, Florida Keys — “Shelmore,” a rehabilitated loggerhead sea turtle was released back to the wild Saturday off the Florida Keys after surgery at the Marathon-based Turtle Hospital to remove a two-foot-long eel from its body cavity, and subsequent convalescence. In September, veterinarians at the facility performed a three-hour procedure to remove a goldspotted eel from the critically ill subadult turtle that had been rescued off the Florida Keys by the U.S. Coast Guard. X-ray images had led Turtle Hospital staff to believe the mass was a severely infected turtle shell gland. Instead, they made a shocking discovery. Hospital officials likened the incident to a fictional horror movie. Because sea turtles don’t normally eat eels, how the creature became lodged inside the sea turtle remains a mystery. The Turtle Hospital opened more than 31 years ago as the world’s first state-licensed veterinary sea turtle hospital. The facility, equipped with three turtle ambulances for patient transport, has treated and rehabilitated more than 1,700 injured sea turtles and assisted scores of hatchlings gone astray after exiting their nests.